HALBAN The new Master of Science programme in Computer Sciences at GUtech takes advantage of the strategic direction of the Sultanate of Oman towards industrialisation and entrepreneurship in the field of Information Technology. GUtech’s Department of Computer Sciences will start the MSc programme in March 2019; partial scholarships are available. 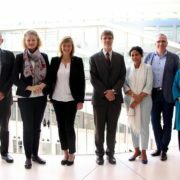 “The programme provides a unique, comprehensive curriculum consisting of theoretical and applied knowledge of Computer Sciences, IT technology management and emerging technologies in large data processing and analysis. The subjects taught include machine learning, big data analytics, and network forensic as well as network security. By choosing a specialisation, students can prepare for their favourite career paths. 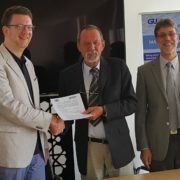 In addition, GUtech has signed a ‘Study Abroad’ agreement with Hasselt University in Belgium, which allows students to take one additional semester and earn a second Master degree in Transportation Science. Possible future career paths are as transportation planners, traffic safety consultants or a managers of public transportation companies,” said Prof. Dr. Nabil Sahli, Head of the Department of Computer Sciences at GUtech, while adding that the MSc programme is tailored to equip the students with entrepreneurial skills matching the national priorities for a profitable and sustainable growth. The MSc programme is designed for fresh graduates and working professionals having Bachelor degrees in Computer Science, Information Science, or an equivalent degree with a solid background in programming and software development skills. “Classes will be held during the week between 4 and 7 pm and on weekends. International faculty members from GUtech, RWTH Aachen University as well as from Belgium and Canada will teach the programme. Admissions for students with alternative qualifications are subject to the outcome of an interview,” said Prof. Dr. Nabil Sahli. 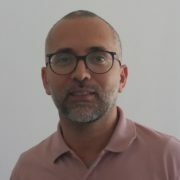 For more details, please visit the GUtech website: https://www.gutech.edu.om/master-programmes/ or contact Prof. Dr. Nabil Sahli by email to pg@gutech.edu.om. HALBAN To enhance awareness on electric cars and the electric mobility in the region, the German University of Technology in Oman (GUtech) is proud to be the official Academic Partner of the second annual eMobility Forum Oman to be held on 20 January in Muscat. Dr. Oualid Ali, Director of Training and Smart Solutions Centre (TSSC) at GUtech will give one of the keynote speeches on smart cities entitled “Electric vehicles for future smart and sustainable cities: opportunities and challenges for Oman”. “In my talk I will present the challenges and opportunities of the adoption of electric vehicles in the capital Muscat and overall in Oman. 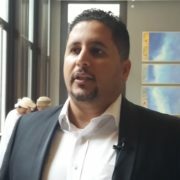 As examples of such challenges, I would like to mention the so-called ‘government buy-in’, in terms of regulation and the ‘citizen buy-in’ and adoption of electric vehicles and the infrastructure upgrade such as charging stations.” Said Dr. Oualid. In addition, students from the Mechanical Engineering Club at GUtech will have the chance to test-drive some of the latest electric car models from Renault, GM, Chevrolet and Tesla. HALBAN A group of international architecture students recently visited GUtech and conducted an excursion to the old district of Nizwa. 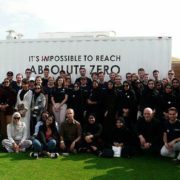 Following their visit to GUtech the students participated in an international student workshop within the Solar Decathlon Middle East competition held at Zayed University in Dubai. 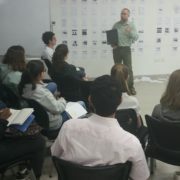 The sustainability of contemporary architecture projects including the building performance and quality control were leading themes of the workshop. 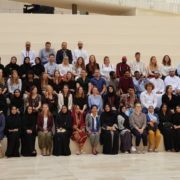 A total of 53 international students from Germany (University of Applied Sciences in Erfurt), Dubai (Zayed University) and GUtech participated in the workshop. The workshop was led by Assoc. Prof. Alexander Kader (GUtech), Prof. Thorsten Lomker (Zayed University) and Prof. Sven Steinbach (Erfurt University of Applied Sciences). Thirteen students from the Department of Urban Planning and Architectural Design (UPAD) at GUtech worked along with 20 students from the Department of Interior Design from Zayed University and 25 students from the Departments of Architecture, Engineering and Building Technology of the University of Applied Sciences in Erfurt. SALALAH Under the auspices of H.E. Abdul Aziz bin Mohammed Al-Rowas, Adviser to His Majesty the Sultan for Cultural Affairs and President of ICOMOS OMAN, 30 international experts, high Afghan Government officials and international donors from Italy and Japan gathered for a three-day technical meeting in Salalah recently, to discuss the future of the Bamiyan UNESCO World Heritage property and to enhance international cooperation between all relevant stakeholders. The Bamiyan World Heritage site in Afghanistan has been under UNESCO world heritage protection (since 2003). 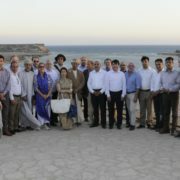 During the meeting, the participants discussed the recent decisions of the UNESCO World Heritage Committee, to improve awareness on international debates regarding the ethics of recovery and reconstruction of cultural heritage, aiming at removing the property from the list of World Heritage in Danger. The international meeting was sponsored by the government of Japan and organized jointly by the Government of Afghanistan, the UNESCO JFIT programme, the German University of Technology in Oman (GUtech) and Research Centre Indian Ocean (RIO) at GUtech. According to UNESCO, the cultural landscape and archaeological remains of the Bamiyan Valley represent the artistic and religious developments which characterized ancient Bakhtria between the 1st to the 13th centuries, integrating various cultural influences into the Gandhara school of Buddhist art. The area contains numerous Buddhist monastic ensembles and sanctuaries, as well as fortified edifices from the later Islamic period. The area is also testimony of the tragic destruction by the Taliban of the two standing gigantic Buddha statues, which shook the world in March 2001. To reflect on a possible application of the Omani archaeological park model to the Bamiyan World Heritage property, in Afghanistan, the participants of the international meeting undertook visits to the Land of Frankincense World Heritage property, including the Al Baleed and Khor Rohri museums and its interpretation centres. Inspired by the field visit to the archaeological park in Oman and the ICOMOS ‘Salalah Guidelines for the Management of Public Archaeological Sites’, participants actively discussed opportunities and challenges and how to further protect and promote the Bamiyan World Heritage property. The meeting included six sessions. The first two sessions presented the current status of the Bamiyan World Heritage Site and current issues of the development in the Bamiyan Valley respectively. The third session focused on the potential rehabilitation of the Eastern Buddha Statue and the fourth session brought up the issue of creating an Archaeological Park in Bamiyan. The following sessions were roundtable discussions regarding donor initiatives in Bamiyan and the final session presented the results of the meeting and opened the discussion for further recommendations. Activities carried out by the Government of Afghanistan, UNESCO and national and international experts, through generous financial assistance from the international community were presented to assess the progress of work in Bamiyan. During the meeting, development initiatives to increase the quality of livelihood of the local community were also introduced by the Afghan government, including a by-pass road and a stone-pavement road in front of the main Buddha cliff, as well as the Bamiyan Strategic Master Plan recently approved by the President of Afghanistan. Prof. Jansen from RIO/GUtech is actively involved in the ‘Bamiyan Cultural Master-Plan’ since 2002. Group photo of the participants of the International Technical Meeting on the Future of the Bamiyan Heritage Site in Khor Rohri, Sultanate of Oman.